One of the defining developments of 1960s art in Southern California was a hybrid of sculpture and painting made of molded acrylic or polished resin. Such plastics could be made to reflect light and emulate the conditions of sea and sky. 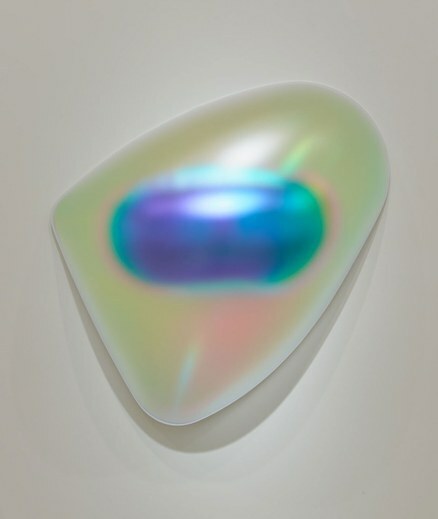 Craig Kauffman was the first to use vacuum-form molding, spray painting the interiors of his convex wall-mounted pieces with brilliant colors or pastels. 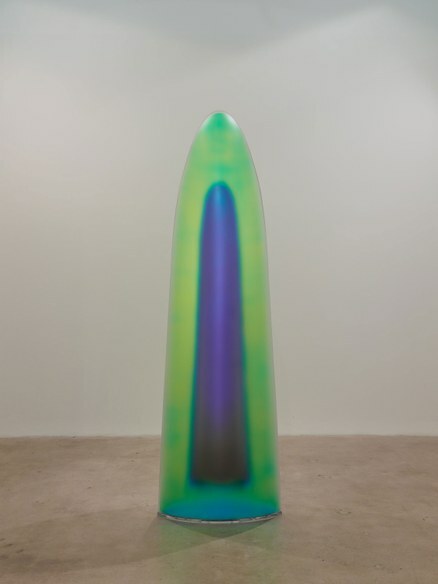 DeWain Valentine, Peter Alexander, Frederick Eversley and Judy Chicago were among those who also stretched the boundaries of the unconventional medium. Critics called it Finish Fetish. Their work had long fascinated Gisela Colón, who was born in Puerto Rico has lived in LA for decades. The artist was inspired to further explore the potential of molded acrylic. After several years of experimentation, in these pieces from 2016, Colón has produced one of her strongest shows to date at Diane Rosenstein Gallery. 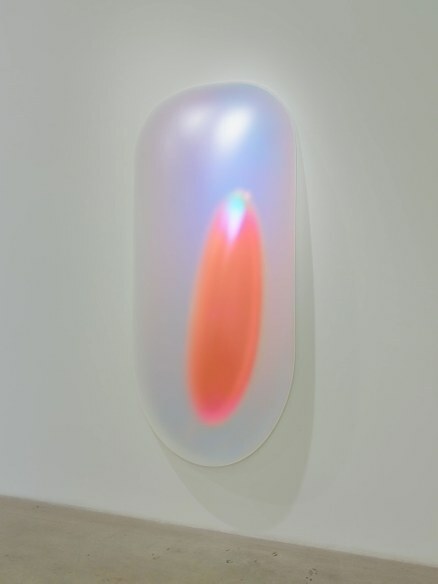 Colón developed her own methods of layering molded sheets of acrylic in jazzy colors that are not painted, not lit from the interior or exterior yet seem to radiate a constantly shifting rainbow of hues. The external shapes are softly curved at the edges, evading precise geometry while referring to the simplicity of 1960s Minimalism. Most are elongated vertical forms that contain mysteriously veiled lozenge shapes within. (Colón has presented such pieces horizontally in the past and says they can be exhibited in either direction, referencing the standing human figure or the landscape.) 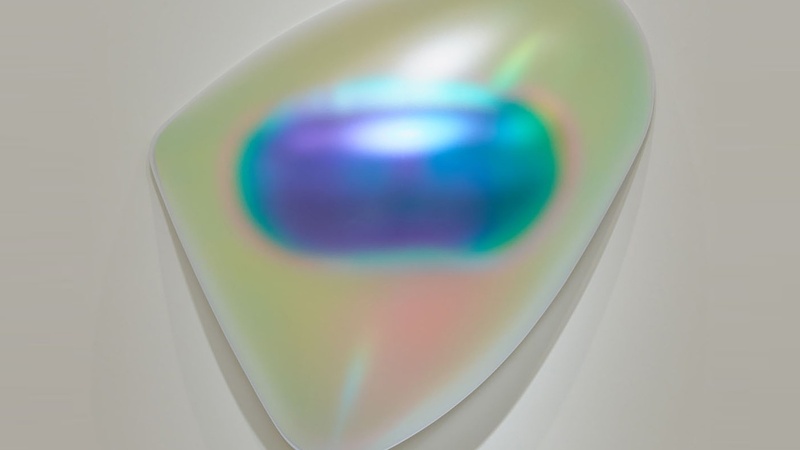 Those inner forms have a metallic sheen that reflects light diffused through the translucent bubble that surrounds them. "Rectanguloid Progression (7 Units Silver)" alludes to the serial nature of much Minimal art. A series of misty rectangular pieces with silvery centers is arranged in a line along one wall as a single piece. Their aqueous color reminds us of dawn or light on the ocean. Works such as "Hyper Ellipsoid (Gold)" contain dramatic centers covered in gold. They appear warm and sensual, even luxurious. "Skewed Square (Gold)" deftly balances the irregular inner and outer shapes in tones of turquoise, ivory and gilt. All art must, in some way, engage the perceptions but Colón's work generates a continuously changing response. Depending upon where you stand, the time of day, the light striking the art, they are never visually stagnant. 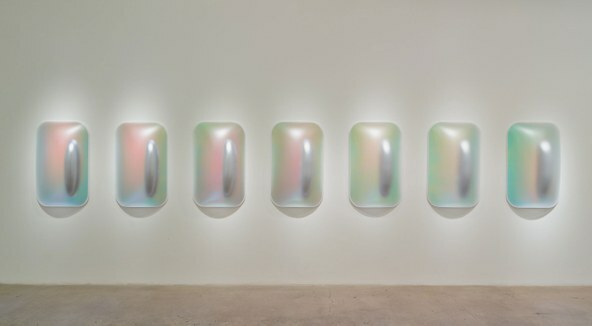 Instead of the "specific objects" of the Minimalist era, these are what she likes to call "non-specific objects," works that hover between painting and sculpture, between solidity and evanescence, pulsating with energy as though they were living organisms. Art comes from art and Colón's show underscores the fact that artists continually reanimate the history. The show is on view through February 18.